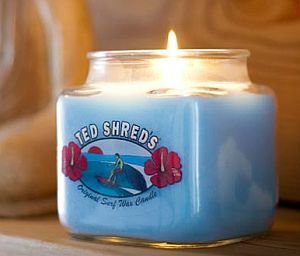 Ted Shred’s candles smell like surf wax, which is apparently coconut, beach air and sunshine. It sounds like a fun summer reminder year round, whether you’re a surfer or not. I’m nowhere near the ocean and have never been surfing (if you don’t count the childhood Styrofoam thingies), but I like the idea. The summer collection includes jars, tins, pillars and air fresheners. You can find Ted Shred’s surfing scents at Orca Shop (The Online Surf Shop).